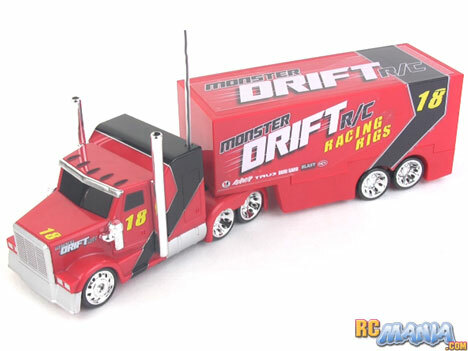 The Maisto Tech Monster Drift Rigs are a surprising departure from the normal types of RC vehicles you see in stores. Street cars are common. Monster trucks are common. This is a drifting tractor-trailer rig -- not designed to carry drift cars, but to actually drift, itself! The truck section based on the same basic chassis as the Monster Drift cars I previously tested, but with new styling and an extra, unpowered axle added to the rear. The trailer part also has hard plastic drift tires on it, but unfortunately it doesn't have a door, so you can't put things inside. You might expect a truck & trailer setup like the Maisto Monster Drift Rigs to be a little slow, but this thing is quick. For its size, even pulling the unpowered, long trailer behind it, it accelerates quickly and holds an impressive speed for its size. It doesn't turn very sharply with the trailer, but that's no surprise. On a normal outdoor surface like asphalt or sidewalk-texture concrete, you won't do a lot of real drifting with the trailer hitched up, because there's just too much traction. If you steer left & right at speed, you will see the trailer start to jacknife around a bit, and that's cool, but it won't continue to rotate around. For that you need smooth surface like very smooth concrete in a carport or garage, or hardwood or linoleum indoor flooring. With the trailer removed, the truck gets even faster. It's also more nimble, and you can force it to break traction more easily. Even on higher-traction terrain you can do 180 fishtails and occasional 360 spins mixed with some brief drifts. On a smooth surface the Maisto Monster Drift Rigs truck can drift just like the car version, it's just taller and more surprising to see. This Maisto Tech Monster Drift Rigs truck exceeded my expectations. I already liked the Monster Drift cars a lot, but there's something extra cool about a vehicle that can do something it's not supposed to do, like a semi truck that can go fast, and drift. The target age for this vehicle is 6+, but I think kids a little younger and even older can have a lot of fun with this great little RC set. Note: This review is not a paid advertisement. I evaluated this product without bias based on its actual performance.